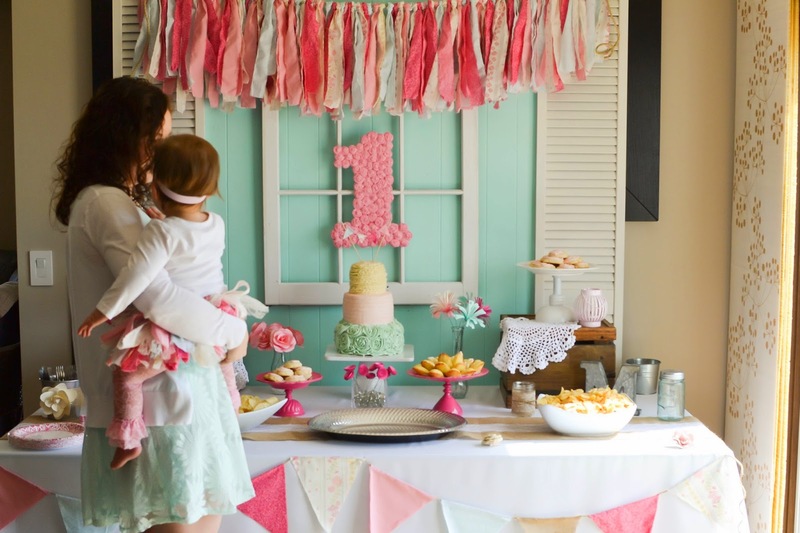 I am sorry that I have been lacking on blog posts this week, but Grace's first birthday party turned out to be a much bigger project than I anticipated. Now that the party is over it is time to get back to blogging. 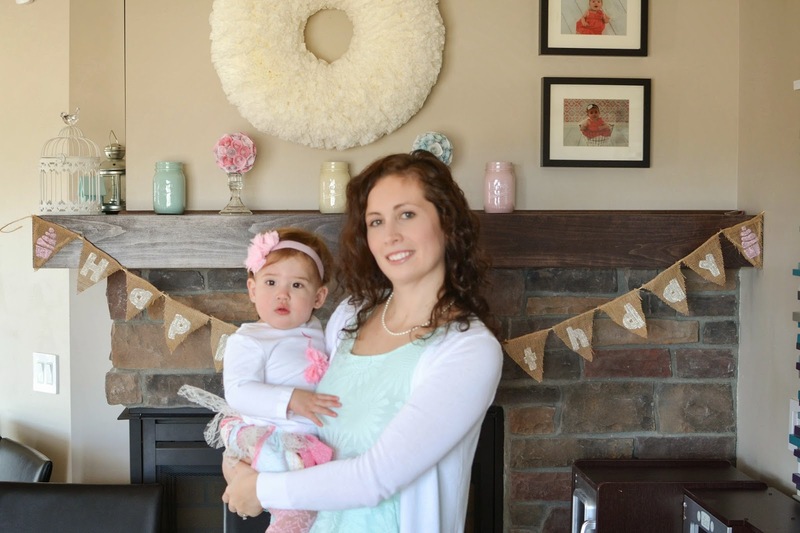 We celebrated Grace's first birthday on Saturday with 20 of our closest friends and family. 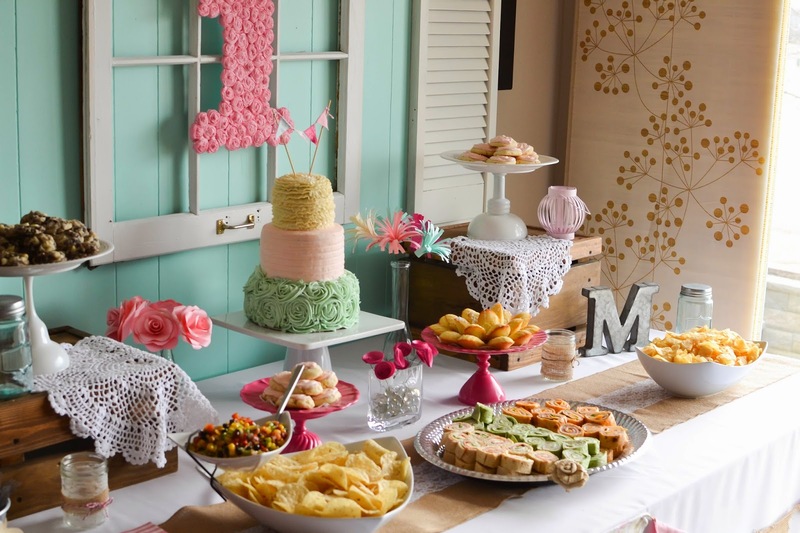 Here is a closer look at Grace's shabby chic party. I was a little nervous on the day of the party because Grace did not sleep well the night before, and only napped for an hour before guests arrived. I was so worried she would have a major meltdown around party time, but I was pleasantly surprised. She could not have been in a better mood. 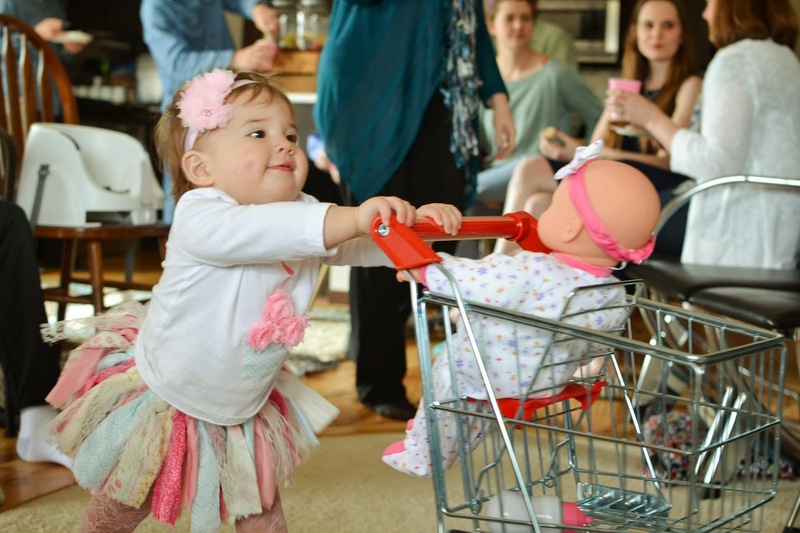 People have always told me that children have no idea what is going on during their first birthday party, but I am pretty sure that Grace knew everyone was there for her. 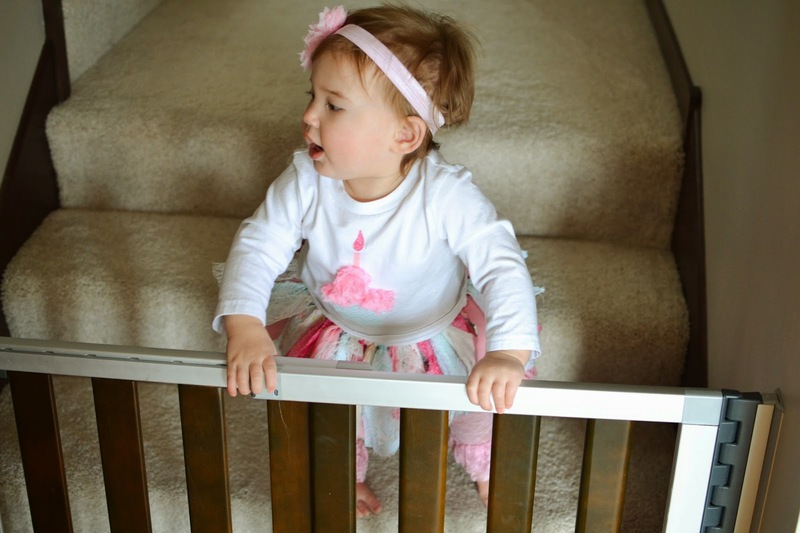 She couldn't wait to come down the stairs to join the party and ham it up for everyone! For Grace's party theme I wanted something girly that I could easily throw together without having to spend a lot of money. 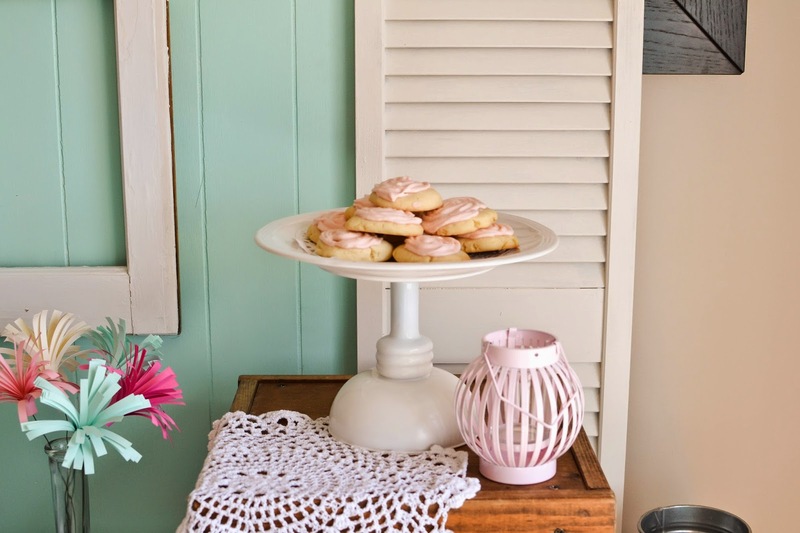 After some intense Pinterest research I decided that a shabby chic party fit the bill perfectly with its emphasis on lace, pearls, and pastels. 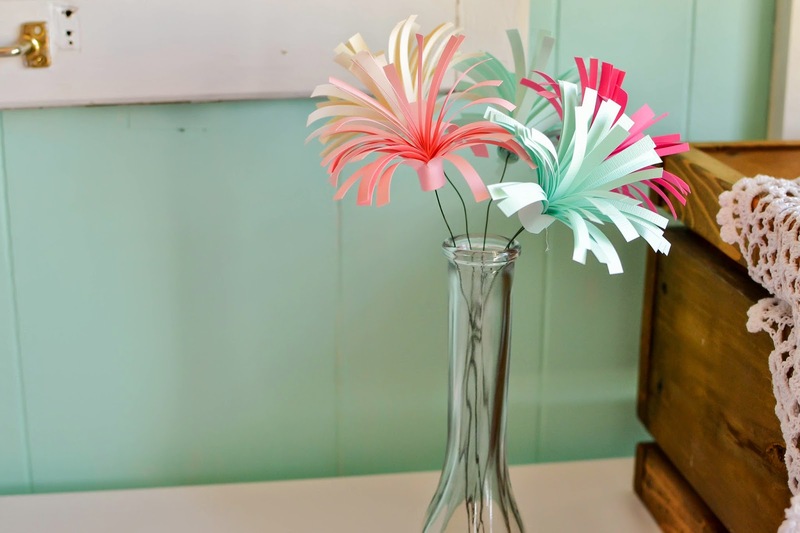 Not to mention I could easily repurpose a ton of wedding and party decorations I had hidden in my basement. 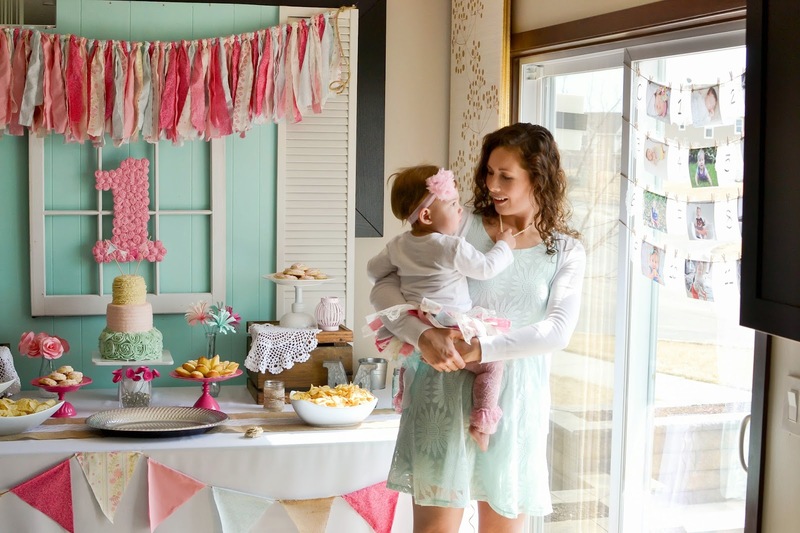 The focal point of the party was the buffet table which included a color pallet consisting of aqua, ivory, and shades of pink. 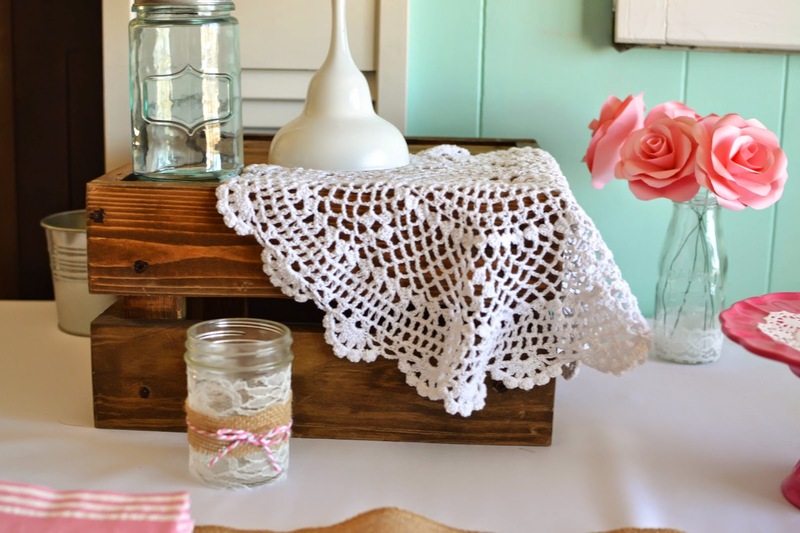 I love to decorate with rustic materials such as wood, burlap and galvanized steel. I also added feminine accents like flowers, lace, and pearls. For the backdrop I painted some old paneling and louvered doors my parents had lying around and nailed them together. In front of the panel I attached an old window frame I had used at my wedding and hung a fabric garland. 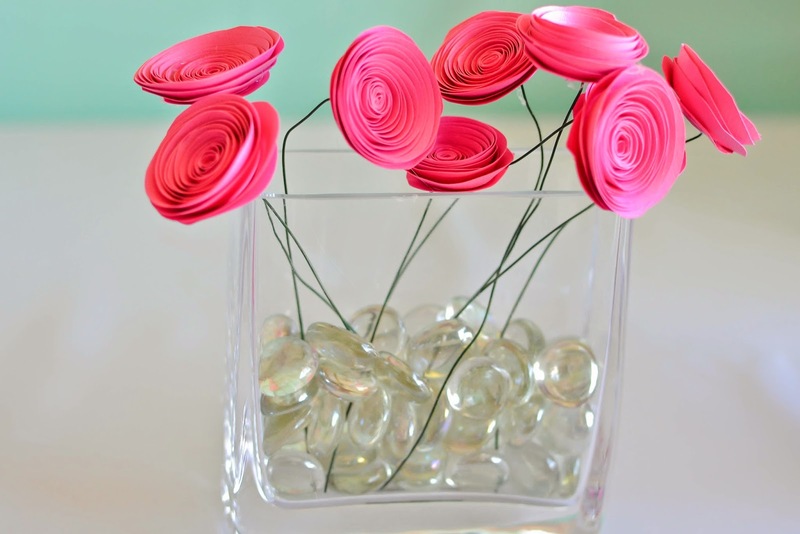 To complete the look I created a large number 1 using crepe paper rosettes. 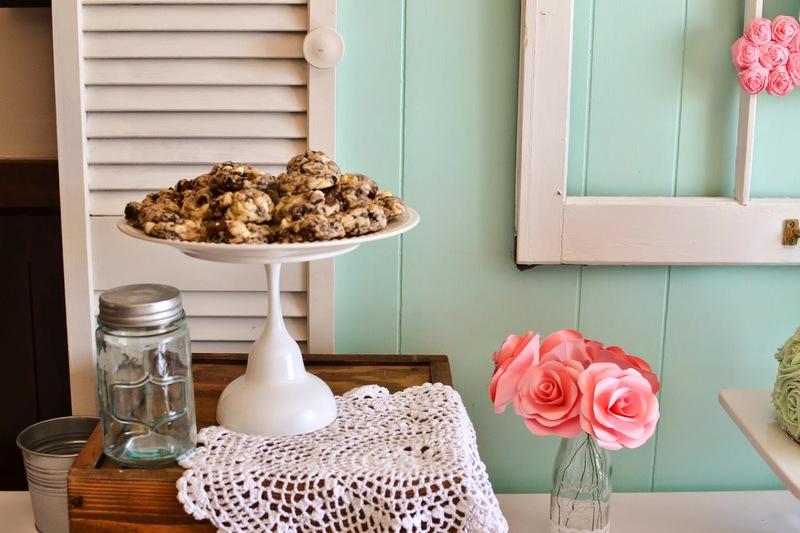 To add dimension and height to the buffet table I used some old wooden crates my father so thoughtfully made and stained for me years ago along with some homemade cake stands made from old dishes. 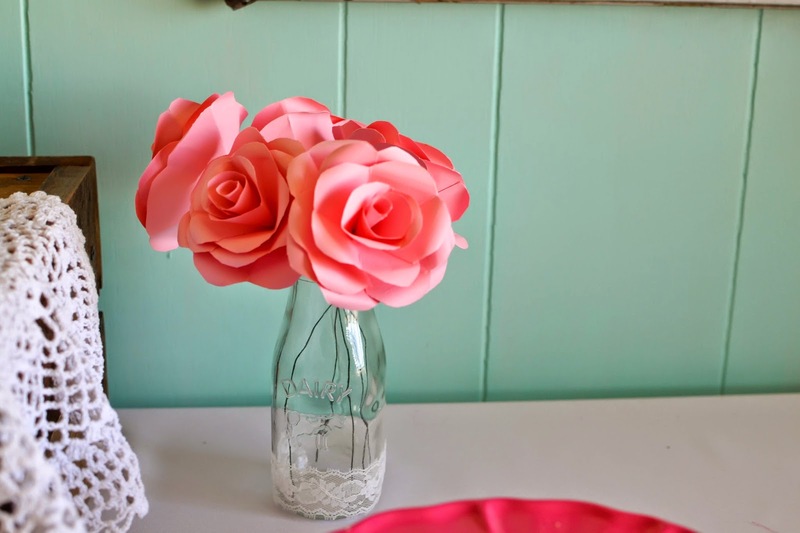 Paper flowers and decorated mason jars helped add a homespun feel to the party decor along with a splash of color. 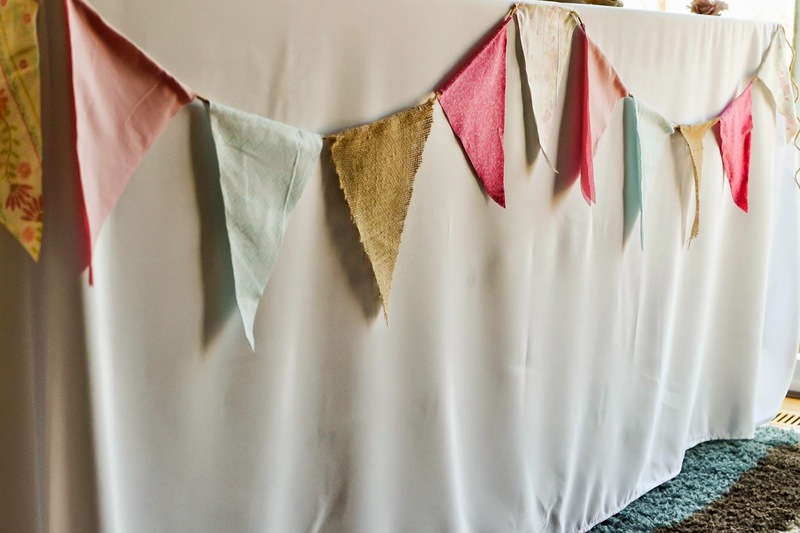 I used a ton of fabric in the decor for added color and texture including a fabric bunting that hung from the plain white tablecloth. 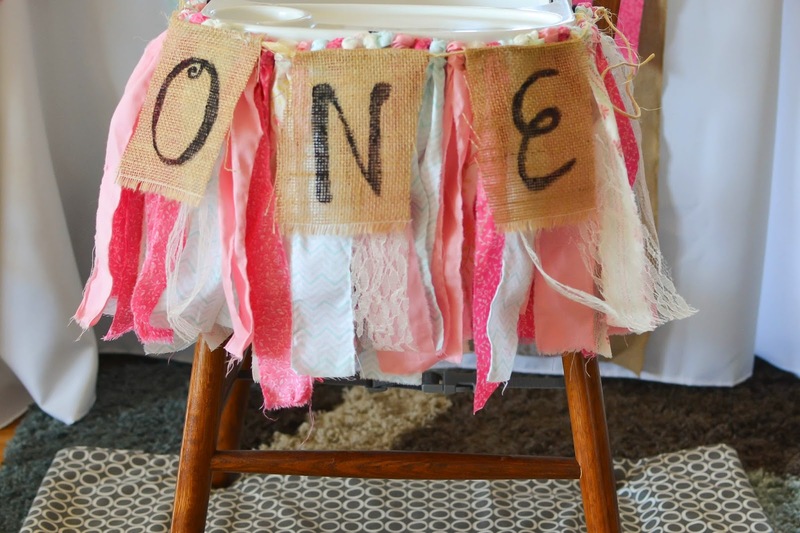 A fabric garland and painted burlap banner decorated Grace's highchair. It was attached with velcro for easy removal when taking Grace in and out of her booster seat. 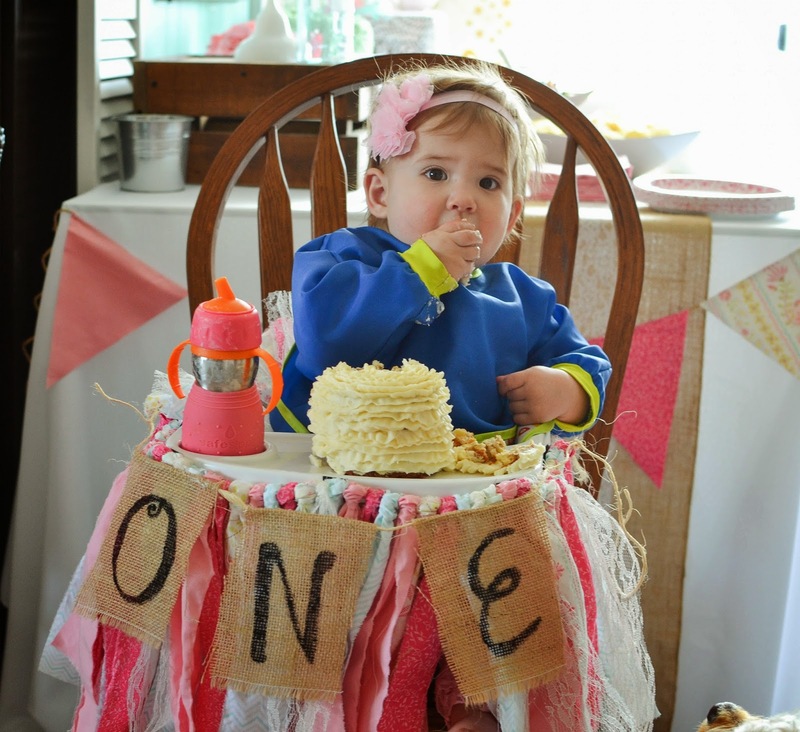 Not to mention it made those adorable cake eating photos even cuter, if that's possible. 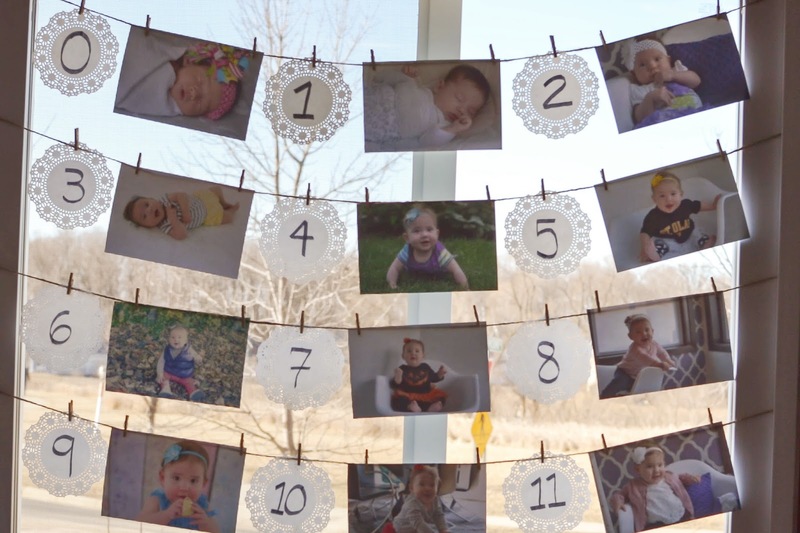 Monthly pictures of Grace hung on our sliding glass door giving guests a visual of how much Grace has grown in only 12 short months. I used 4 inch paper doilies and tiny clothes pins to help extend the theme. Every inch of the main floor was decorated in shabby chic decor including the mantel. 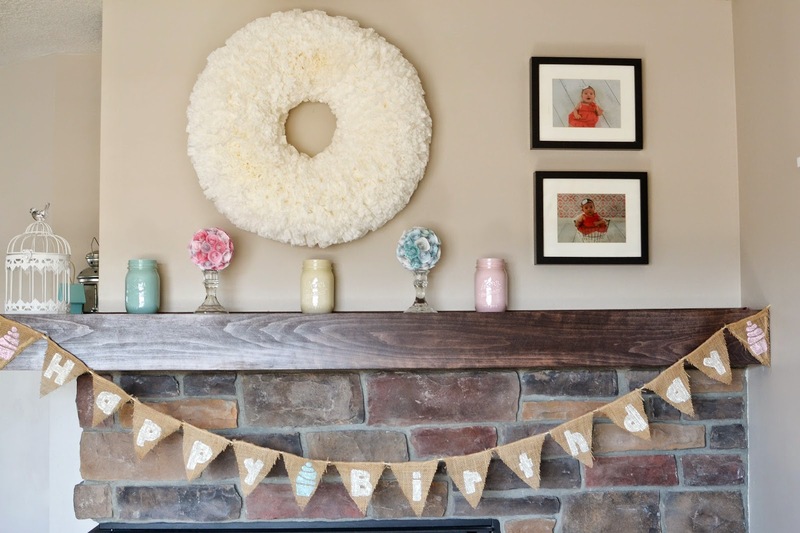 I used a homemade coffee filter wreath as a focal point and added paper rosette kissing balls and painted mason jars for accents. 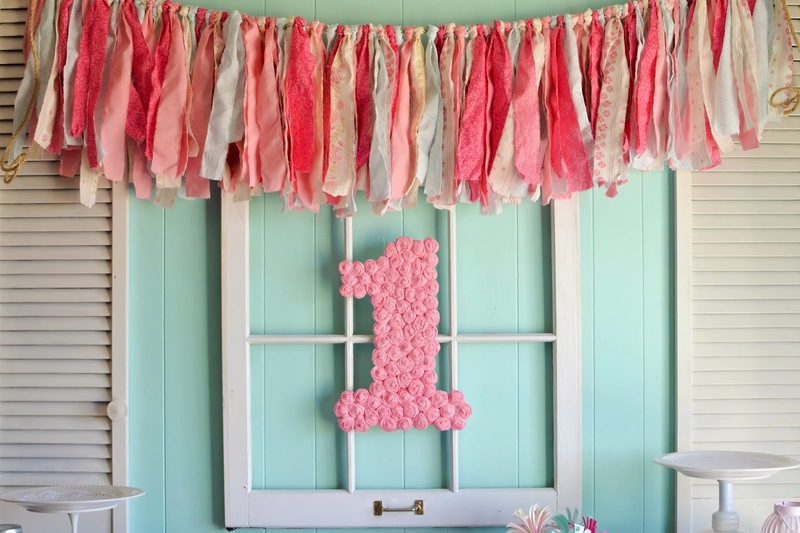 A burlap banner read happy birthday. Just in case people forgot why they were there. Grace's party was from 2-4 PM and was supposed to nicely follow Grace's nap time. Of course the best laid plans never work out. 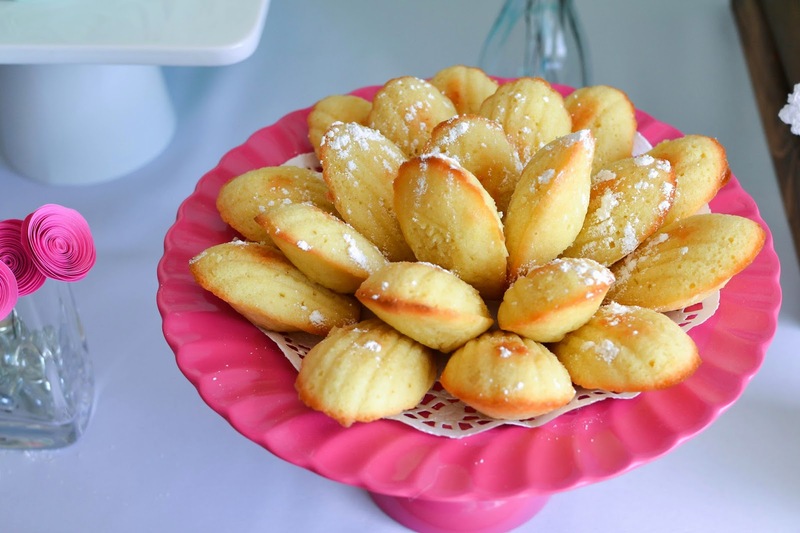 Because the party was not during traditional meal time I served simple appetizers and sweet treats. For appetizers I served 3 different types of pinwheel sandwiches, fresh black bean salsa, and chips. The desserts were another story entirely. 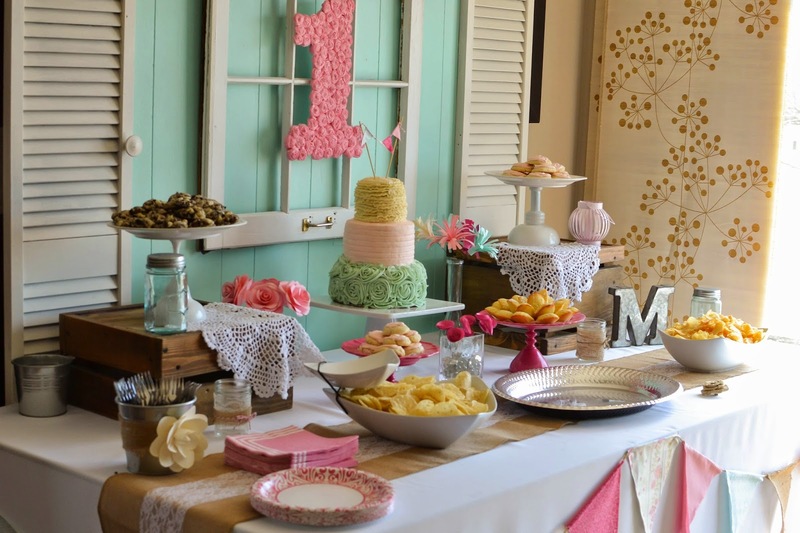 It has become a tradition for me to have a dessert table at every party I throw. For this party at least, I was able to reign in my baking obsession just a little. 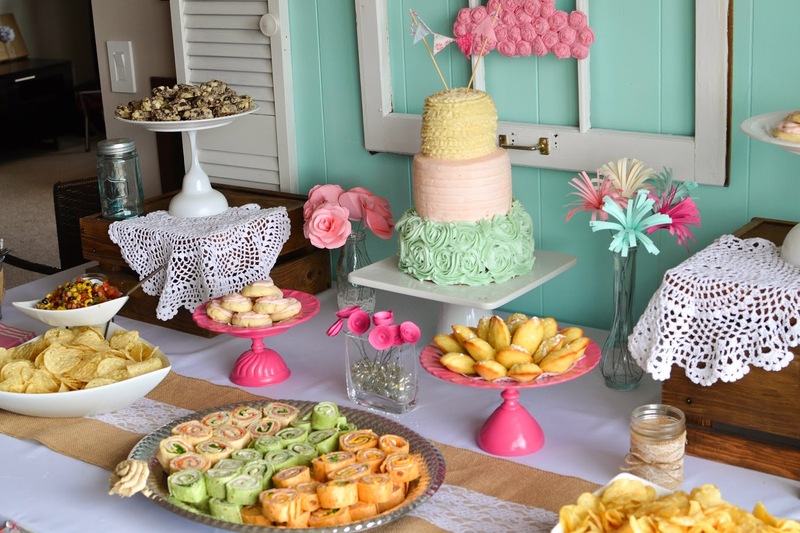 The focal point of the buffet table was a three tier cake which took me hours to bake and decorate. The bottom tier was a fudge cake filled with a whipped cookies and cream filling and decorated with buttercream frosting using a 1M tip. 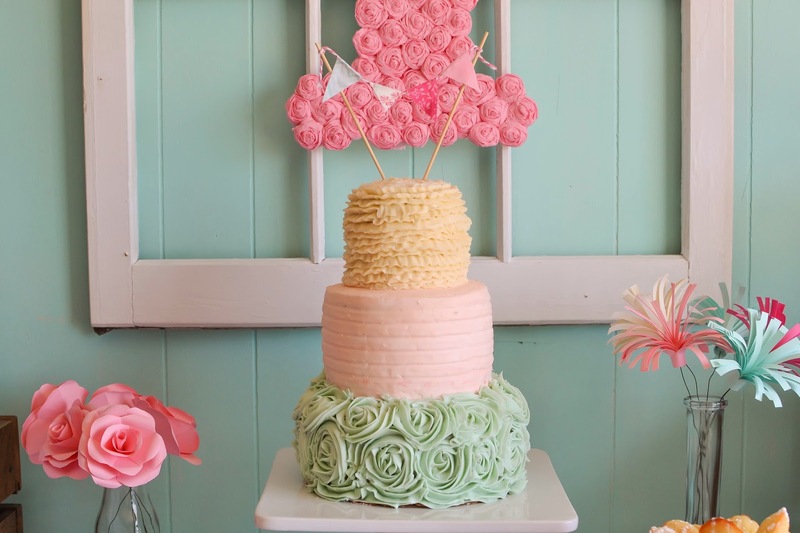 The middle tier was made up of an almond scented cake filled with raspberries and cream cheese icing and covered in white chocolate buttercream. The top tier was just for Grace as it was a "healthy" apple spice cake decorated with cream cheese using a 104 tip. 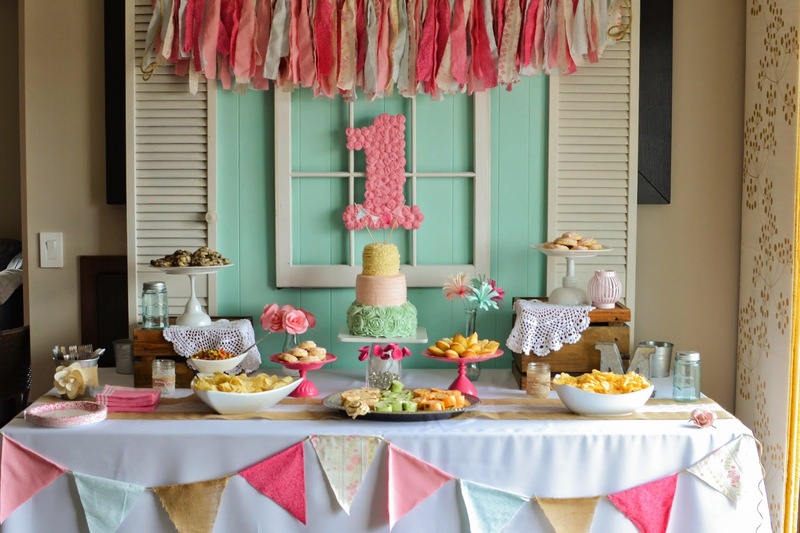 The cake was topped with a mini fabric bunting made from bamboo skewers, twine, and fabric. Grace loved the cake, but seemed to be drawn to the frosting. She has to be one of the cleanest eaters I have ever seen. In addition to the cake I also made 3 different types of cookies including French madeleines, chocolate chip cookies and cream cookies, and Paradise Bakery sugar cookies with Magnolia buttercream. 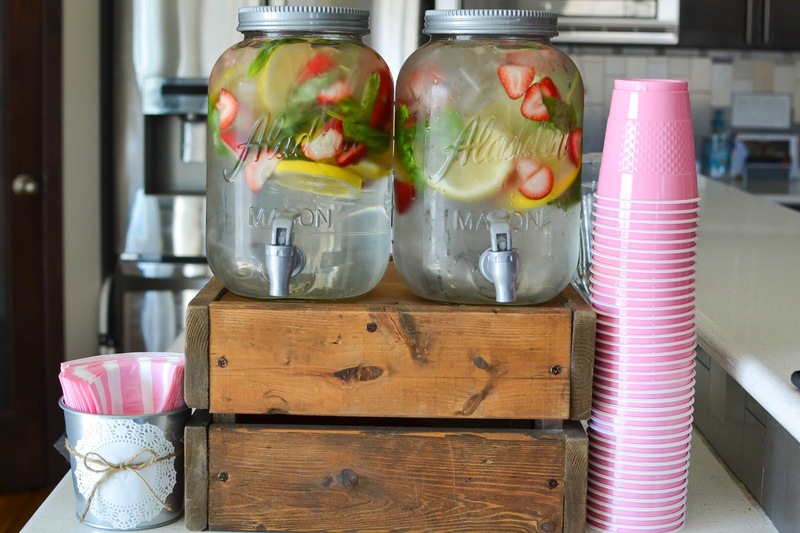 To keep the partygoers hydrated and refreshed I served water infused with strawberry, lemon, and basil in these cute and affordable mason jar drink dispensers. The doily decorated planters from Ikea helped carry the theme over to the drink area. 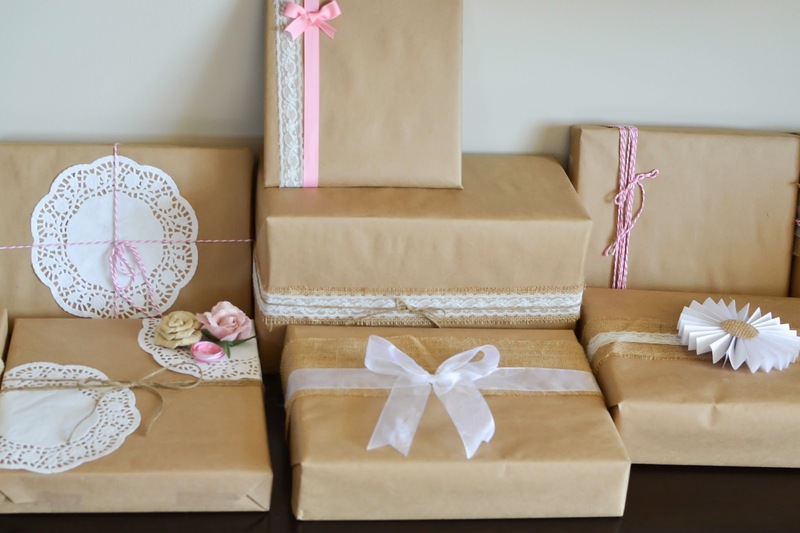 Of course, no first birthday party would be complete without gifts wrapped using brown shipping paper, lace, burlap, and ribbon. Just kidding. 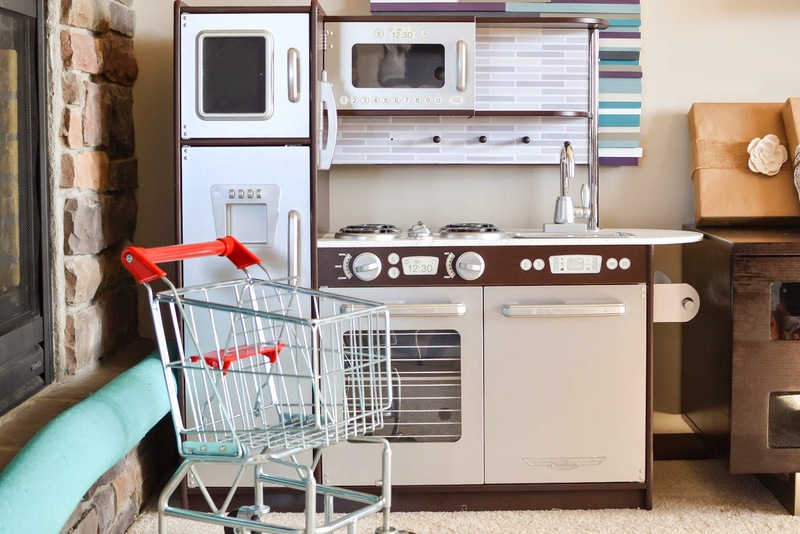 For her birthday Grace received her very own KidKraft Play Kitchen complete with food and a Melissa & Doug Shopping Cart from mommy and daddy. I am absolutely in love with this kitchen. 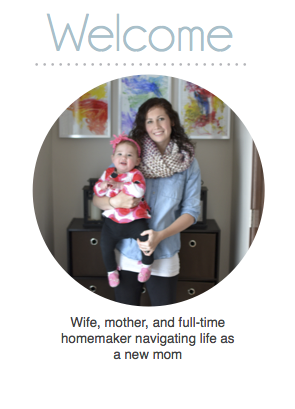 Besides the fact that it matches mommy's kitchen perfectly it is also made from wood and incredibly sturdy. The only downside is that it took Anthony almost 3 hours to assemble. I am so glad that I didn't have to do it. 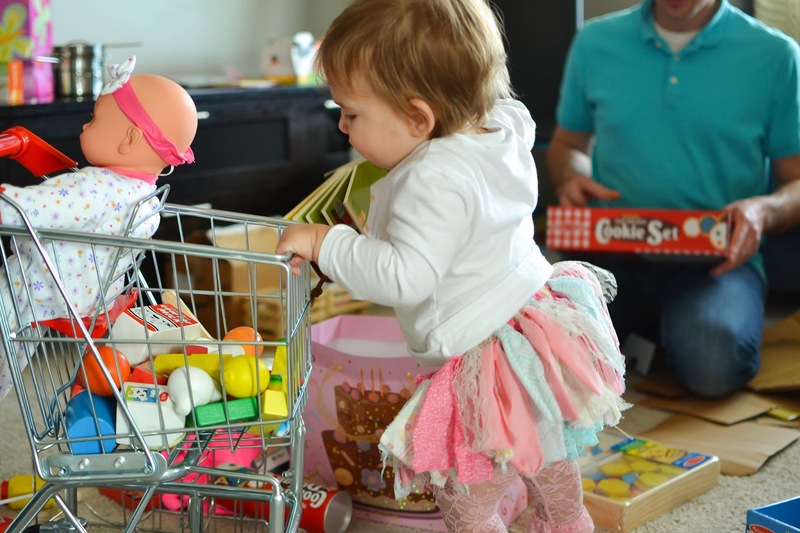 Grace on the other hand was a huge fan of her new shopping cart. 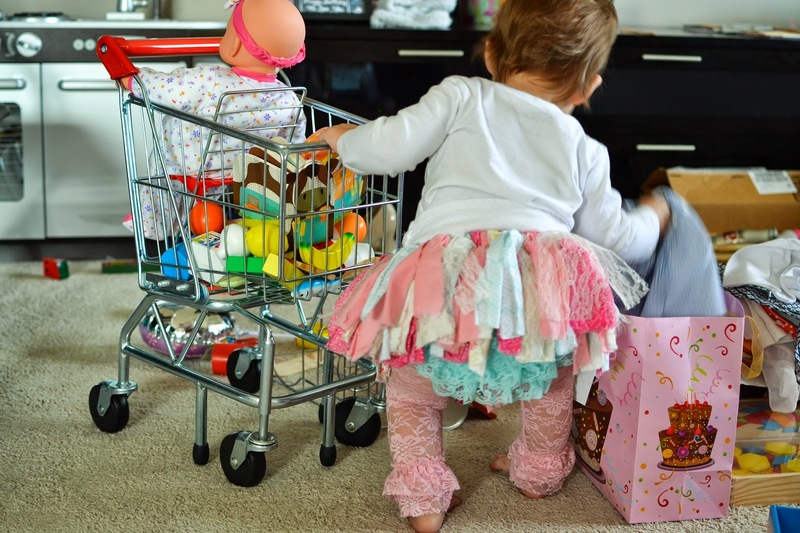 She spent the rest of her party pushing her new doll around and filling up the cart with all of her new toys. When she wasn't busy with the cart she was putting on a show for everyone. 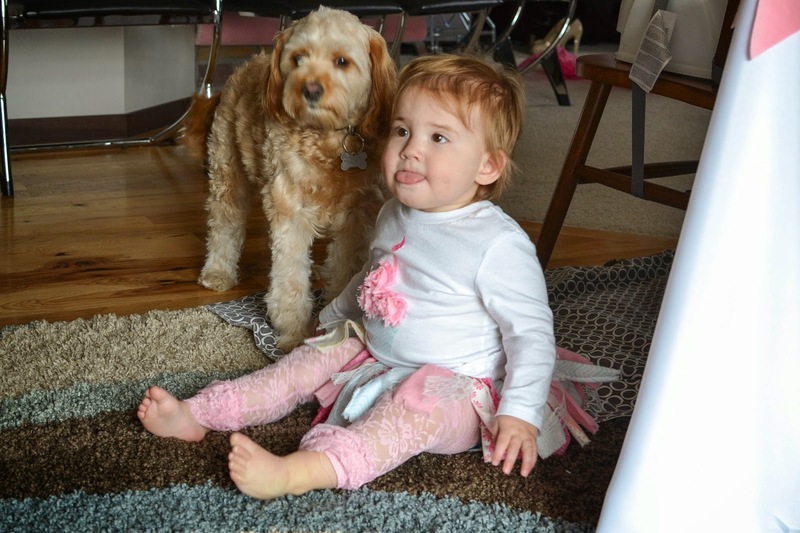 She absolutely loves to be the center of attention and spent the majority of the party with her tongue sticking out. Happy birthday silly girl. Mommy and Daddy love you!